This is one of those crazy-good, lick-the-bowl sauces. Everyone will beg you for the recipe. You, like me, will be the queen (or king) of the potluck when you serve this with spring rolls, dumplings or even sweet potato fries. 1 tbsp rice vinegar $2 for 10 oz. 1-2 tsp(s) Asian chili sauce $2 for 8 oz. Combine all ingredients in a food processor or blender. Adjust spiciness to taste by adding more or less chili sauce. If the sauce is too thick and needs to be thinned out, add a little hot water. To make into peanut salad dressing, increase the rice vinegar to 1/8 cup. Makes about 3/4 cup peanut sauce. I never thought to add coconut milk to peanut sauce, delicious! 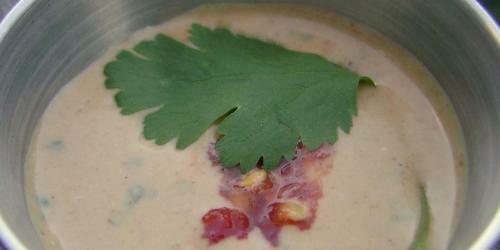 I love peanut sauce and coconut milk, so I will be sure to try this recipe out. Thanks! Thank you so much for posting this amazing sauce! I was able to throw together a quick but special dinner for a vegan friend of mine using this sauce,some whole wheat pasta, and green onions. He ate two helpings! Keep sharing the joy!! You are completely right. This sauce is drinkable. I had to put it away before I ate spoonfuls of it! How long will this stay good if kept in the fridge? My boyfriend and I just love it, eating it with just about everything. I even stoop so low as to dip saltine crackers in it. I would like to make a big batch all at once so I don’t have to dig the food processor out every couple of days…..Thanks! Your recipe was featured on my Fox in the Kitchen MMM (Must Make Monday) Series. This sauce is seriously good. I put it on everything, from noodles to grilled chicken skewers to veggies. Thanks! I am video editing expert as well as I love to make animated videos and last week I did work for cooking project and made 100+ cooking videos which is relating to different recipes. If you want to promote your business more than hire an online video marketing services for better results. Sauces taste quite delicious with fried food items like French fries and chicken or fish sticks and it is also used in making of the food in different ways. Very easy to prepare, thanks for your recipe, this sauce will changes the taste of my food. Worldwide customer financial is included 5 vital service devices. These systems consist of retail financial, citi commercial financial institution, citi branded cards, citi home mortgage & retail providers.